QAEngine is an ultra-modern and feature-rich theme for creating a question and answers site. The flat-style design, minimalist feel, and advanced functionality would make this the perfect match for those trying to find a state-of-the-art solution for a question and answers section or site. 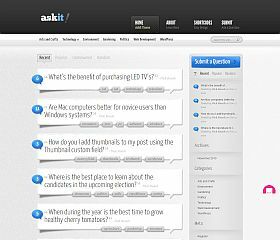 Askit turns your site into a feature-rich, fully-functional, question and answer portal. Visitors can ask and answer questions of each other, or to you directly – depending on how you set it up. Any visitor can ask or post answers to questions that can then be voted on by your community to choose the “best” answer. 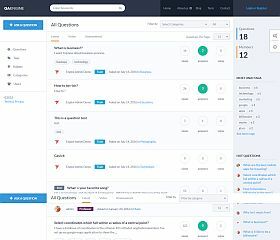 Answers is one of the most powerful and customizable themes of its kind, and gives you everything you need to create a dynamic and great-looking Q&A portal. Relying on your visitors to help create content, it will not only provide you with a great solution for a website (or section of a site) – but the user-generated content allows you to easily and effortlessly build a large base of traffic. 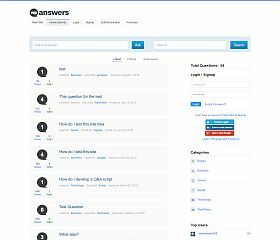 WP-Answers helped pioneer Q&A themes, delivering a solutions that has nearly any feature or option you would want. It works just as well as a standalone site as it does being a section of your website or blog – included are numerous features which help your website visitors interact and engage, while built-in social components help encourage viral growth (through Facebook, Twitter, etc.). 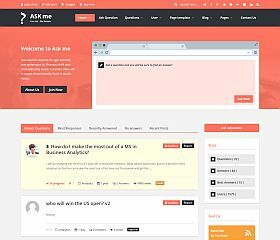 Ask Me provides a modern-styled solution for question and answer sites. Built with HTML5 and CSS3 (giving you the latest features in web development and a beautifully-responsive layout). The design features a contemporary flat-style look, clean and bold typography and styling elements, and features one of the easiest-to-use interfaces that you will find in this roundup. 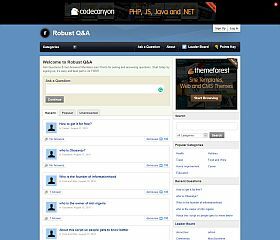 Robust Q&A has been designed to provide countless features and functionality, this is another feature-rich and enhanced theme for WordPress. Features: leaderboard for top users, registration and member management, responsive design, and comes with everything you need (so no need for extra plugins). It has slick jQuery effects, tabbed content areas, and a host of other features. 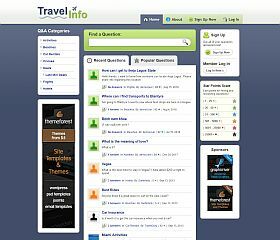 Instant Q&A is somewhat reminiscent of the look and style of Yahoo Answers, this theme incorporates many different features and design styles to give you a clean and professional site. 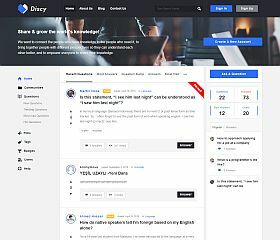 Discy is a theme somewhat like Stack Exchange in it design and functionality, allowing you to create a community of questions and answers. Features: Responsive layout and design, polling capabilities, member registration and dashboards, voting, social network integration, and more. AskBug is a premium WordPress theme that was developed to work exclusively with the AnsPress WordPress plugin. 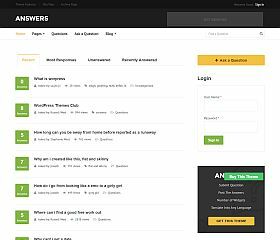 It’s a community-driven question and answer theme for WordPress that includes all of the features and functionality you could want for this type of site. 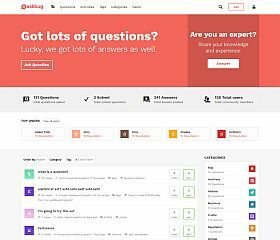 Whether you’re trying to provide a solution for an existing website or want to create a standalone site – these WordPress themes will provide you with everything you need to create a full-featured question and answer portal (similar to Quora, StackExchange, or Yahoo Answers). Many of the themes incorporate a wide variety of customizations and enhanced functionality that will make administering and managing your site easier than ever. Allow your visitors register and post questions and answers of their own, vote up or down responses, and some even include ratings and options for choosing the best responses. Whether you’re trying to build a separate section for your customers or you’re trying to build a large community-driven discussion site, these WordPress themes will provide you with all the tools necessary to create the perfect Q&A site. If you already have a blog or website and want to add question and answer functionality to it, these themes should suit you just fine. However, there are a number of WordPress Q&A plugins that might give you a little simpler integration if you’re not wanting a completely separate theme and/or WordPress installation.